A serum is a skin care product with a high concentration of powerful ingredients and a wide range of benefits, helping to prevent future damage. It works on and beneath the skin, from improving its firmness and smoothness, to the texture and tone while reducing fine lines and wrinkles. You should use a serum both morning and night. If you want to lock the serum into the skin, first allow the serum to absorb and then apply a moisturizer. - Gently warm the serum between your palms. - Use the natural weight of your hands and gently press on to the face and neck. - Facial massage always helps absorption of the product into the skin cells. - Follow with a moisturizer. A serum underneath the moisturizer will boost its hydrating effects. Luna Goddess Nourishing Night Serum is a beautifying and nutritive blend of precious oils to nourish, repair and balance the skin. A blend of Argan, Rosehip and Evening Primrose Oils to increase cell turnover and reduce fine lines and wrinkles, for a brighter, smoother, more refined complexion. - Key Ingredients: Argan Oil - contains high levels of vitamin E and saponins which softens the skin and reduces fine lines and wrinkles. Rosehip Oil - High in antioxidants and vitamins A, C and E, stimulates collagen production and cell renewal, resulting in younger looking skin. Evening Primrose Oil - Contains GLA - an essential fatty acid that help maintain healthy cell structure and increased blood flow to the skin, leaving it glowing, healthy and nourished. Superfood Firming Serum is a complex blend of bio-active plant oils to instantly firm, and regenerate cells for a bright, youthful, glowing complexion. Amalgam of Pomegranate, Chia, Broccoli, Baobab, Passion Flower and Black Cumin oils, with botanical active extracts to boost skin’s vitamins and instantly firm, for a brighter, more youthful complexion. - Key Ingredients: Pomegranate - High in antioxidants, omega 5 and ellagic acid, which promote collagen and elastin production for brighter, youthful skin. Chia - Omega rich oil that soothes fine wrinkles and improves skin elasticity. Broccoli Seed - Rich in vitamin A, C and K. This anti-ageing oil retains moisture and visibly plumps the skin for a youthful appearance. Baobab - Antioxidant rich oil, fights off free radicals to reduce signs of ageing and promote healthy cell turnover. Passion Flower - A superior emollient, rich in omega 3, 6 and 9, vitamin C, calcium and phosphorus for nourished skin. 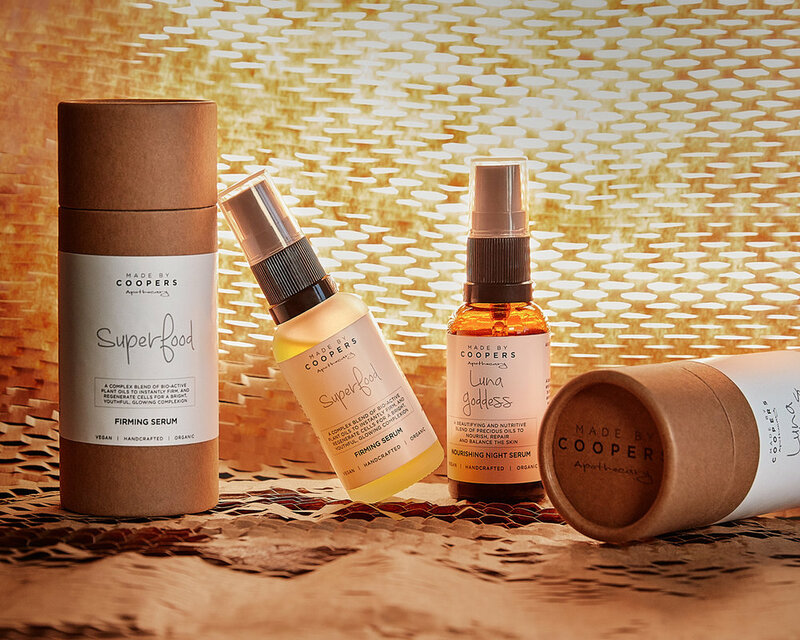 Believing that what you put on the skin and what you breathe in should be as important as what you put in your body; therefore Made By Coopers Apothecary only use natural, organic, clean ingredients and natural preservatives to create their artisan line of beauty and wellness products. Click here to shop Made By Coopers Serum.